I used to be so naive. A few years ago, I had no sense of guitar-banjos except that occasionally I'd see one of the new Gold Tone "banjitars" hanging in Acoustic Outfitters Music Shop, a fine local store specializing in acoustic guitars, banjos, and fiddles. They sounded awful ! One day at AOMS, I picked one up almost out of habit to remind myself how bad they were. It sounded great ! I and was totally captivated and couldn't believe the difference. It turned out that Evan Leonard--I identify him because this is all his fault! --had made one small adjustment. The instruments are shipped with an unwound third string. Evan had swapped it for a wound third, and that made all the difference. I was hooked! I did my homework and decided to seek out a used Deering B-6. I suspected the guitar-banjo wouldn't be a passing fancy, so I wanted something toward the higher-end, like a Deering, but with the used instrument I was hedging my bets. If the bloom faded from the rose, I could probably sell a used Deering for as much as I paid for it. 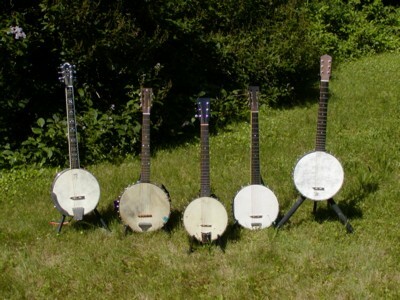 Since my main musical interest is old-time music, I tend to prefer the sound of open-back banjos, so I removed the flange and resonator and had a very nice metal-rimmed, open-back guitar-banjo. A few months later, while browsing through eBay, I made a "find". It's the one on the left in the group photo. A shop was selling a custom Deering Maple Blossom open-back guitar-banjo and nobody was bidding, so I got it for the opening bid. It turned out that the truss rod was maxed out, but the price was so good that I decided to keep it, regardless. With a little coaxing, I've got it to just where I want it. It's been stable for years, so I'm not expecting any problems with it. If I'm being honest, the Maple Blossom with its Fiberskyn head, is the instrument with the best all around sound. The downside to the Deerings (for me) is their necks. They're long. Initally, I found them quite uncomfortable to play, although I've adapted somewhat. Also, they tend to be relatively narrow at the nut. I started looking into the history of the guitar-banjo and was surprised to learn that they had their own niche throughout the early part of the 20-th century. That put me on the lookout for older instruments. I've learned that as recently as the 1990s. they were so out of favor that you could barely give them away. Now, however, as with all older string instruments, they have soared in value to the point where it's hard to find name- brand instruments in good shape for under $1,000. Many are selling for close to $2,000. Some of the Gibson models go for twice that! I found my first old instrument on eBay for $170. It's the second from the left in the group photo. The tag on the dowel stick says "Wurlitzer". It's a good guess that it's from the 1920s. It was a disaster! The rim was twisted and out of round. The strings were way off the fingerboard. On the other hand, it's 12" skin head gave it a great "tubby" sound. The quotes that I got from two shops were for many hundreds of dollars of repairs with no guarantee that the neck wouldn't self-destruct when the instrument was brought up to pitch. The seller was understanding and offered to take the instrument back. I had it boxed and ready to ship the next day when I mentioned the instrument in passing to a local builder who likes a challenge and offered-- insisted, almost--to take a look at it. He thought he had a good chance at truing the rim and, also, lowering the strings a bit by cutting the the rim to raise the end bolt and dowel stick, lowering the angle with which the neck met the rim. It worked! It's not wonderful cosmetically (shown in the photograph with a small silk patch on the skin) and the string height remains very high, but it's still got that great sound. 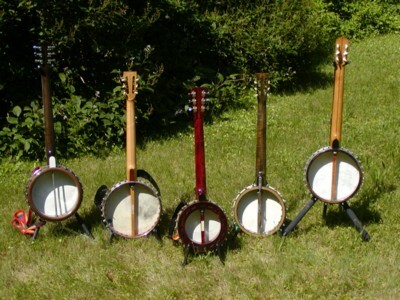 It's almost like playing a "bass banjo", if there were such a thing, when I work the 5-th and 6-th strings. In many ways, it's my favorite. The next one came from eBay, too. A 1920s Weymann Keystone State. The price was reasonable because the fretboard was covered with a sticker under each string at nearly every fret indicating which note was where. I got lucky because they came off completely with a damp paper towel. The sound is a bit crisp for my taste and has me trying to decide whether the sound would improve with a calfskin head. It did not improve with Fiberskyn. 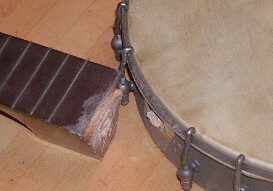 Weymanns have a unique mechanical structure connecting the rim and the dowel stick. The bolt in the middle of the metal connector goes through to a threaded metal plate on the dowel stick. The metal plate--and, therefore, the dowel--moves away from the metal rod or closer to it depending on the direction in which the bolt is turned. 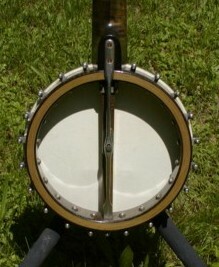 This changes the angle at which the neck meets the rim and raises or lowers the action. And, yes, the metal connector does poke you in the gut when you play standing up! The action is high, even with the bolt turned to the point where I worry about the dowel, so the instrument would benefit from a dowel reset. Since I often find myself in situations where the "tubbiness" of the Wurlitzer would be buried under other instruments, the Weymann is often the guitar-banjo I take with me. The next one was another eBay find. 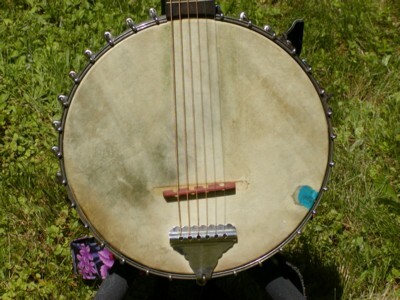 A German guitar-banjo. The label said, "Made in Germany" (no E or W, suggesting that it was pre-WWII.) It wasn't in great shape, but I decided to take a $140 chance on it. In the middle of all this, I became enamored of the idea of getting a Bacon Professional FF guitar-banjo with an internal resonator. I've yet to find one, but on eBay I did find someone selling a pot from a Bacon Professional FF banjo-mandolin. The good thing about a pot is that it sells for considerably less than the entire instrument. If I couldn't have a Bacon Professional FF guitar-banjo, then I'd have the next best thing by having a neck made for the banjo-mandolin pot.